You probably already know that inflammation is at the root of many health problems. And you probably know that in small amounts inflammation is protective and can increase tissue healing. But if inflammation becomes chronic or gets too high, it can have the opposite effect, even causing death. Any time inflammation gets too high, whether it's in response to a dangerous infection or simply the common cold, you want to bring it down as quickly as possible. Fortunately, researchers are discovering that zinc helps do just that. A new study out of The Ohio State University investigated the role of zinc in sepsis. The results were exciting. In human cell culture and animal studies, researchers found that a protein lures zinc into key cells that are first responders against infection. The zinc then helps balance the immune response by interacting with a process that is vital to the fight against infection. This keeps the immune response from spiraling out of control. And a lack of zinc can result in far too much inflammation in the body. This research focused on sepsis. But the findings also help explain why taking zinc at the onset of a cold helps reduce its severity. A lack of zinc seems to leave you vulnerable to infection. But if you do get an infection, adding zinc back into the mix seems to swing the balance back in your favor. Because zinc blocks the action of a particular protein, it's able to prevent excess inflammation. While it may be beneficial to take zinc to prevent inflammation once you have an infection, you're better off not getting one in the first place by keeping your zinc levels where they need to be at all times. We can get zinc through our diets, but researchers estimate about two billion people worldwide, including 40% of those over 65 in the United States, are deficient. The recommended daily allowance ranges from 8 to 11 milligrams for most adults. We get the majority of our dietary zinc from red meat and poultry, but you also can find it in beans, nuts, some shellfish, whole grains, and fortified cereals and dairy. You can get some zinc through a multivitamin, but the amount the multi contains won't be enough to fight inflammation. There's an easy way to tell if you need to be taking extra zinc, whether to prevent inflammation or after you've come down with an infection, such as a cold. All you have to do is let a zinc lozenge dissolve in your mouth. If it has no taste or tastes good, you need to take more. 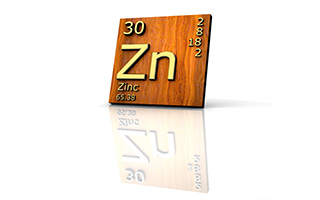 When you've had enough, you'll notice that the zinc has a strong, unpleasant metallic taste. You can find zinc acetate or zinc gluconate lozenge in health foods stores. Both should help get your levels up so that you can fight inflammation – and infections – effectively.